O Mother of Perpetual Help, grant me ever to be able to call upon thy powerful name, since thy name is the help of the living and the salvation of the dying. Ah, Mary most pure, Mary most sweet, grant that thy name from this day forth may be to me the very breath of life. Dear Lady, delay not to come to my assistance whenever I call upon thee; for in all the temptations that assail me, in all the necessities that befall me, I will never leave off calling upon thee, ever repeating: Mary, Mary. What comfort, what sweetness, what confidence, what tenderness fills my soul at the sound of thy name, at the very thought of thee! I give thanks to our Lord, who for my sake hath given thee a name so sweet, so lovable, so mighty. 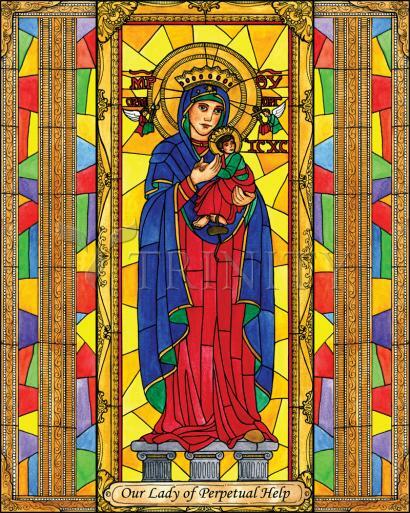 But I am not content merely to speak thy name; I would utter it for very love of thee; it is my desire that love should ever remind me to name thee, Mother of Perpetual Help. O Mother of Perpetual Help, thou art the dispenser of every grace that God grants us in our misery; it is for this cause that He hath made thee so powerful, so rich, so kind, that thou mightest assist us in our miseries. Thou art the advocate of the most wretched and abandoned sinners, if they but come unto thee; come once more to my assistance, for I commend myself to thee. In thy hands I place my eternal salvation; to thee I entrust my soul. Enroll me among thy most faithful servants; take me under thy protection and it is enough for me: yes, for if thou protect me, I shall fear nothing; not my sins, for thou wilt obtain for me their pardon and remission; not the evil spirits, for thou art mightier than all the powers of hell; not even Jesus, my Judge, for He is appeased by a single prayer from thee. I fear only that through my own negligence I may forget to recommend myself to thee and so I shall be lost. My dear Lady, obtain for me the forgiveness of my sins, love for Jesus, final perseverance and the grace to have recourse to thee at all times, O Mother of Perpetual Help.